Barack Obama has launched a committee to explore the possibility of standing for the Presidency of the United States. 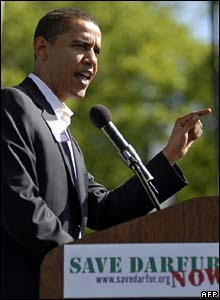 Since he spoke at the Democrat convention in 2004, Obama has got the reputation of being one of the most charismatic speakers in American politics. As Senator for Illinois he campaigned widely in 2006 for various candidates running for the Democrats across the country. He has acquired a reputation for bipartisanship- sponsoring leglislation with Republican senators Coburn and Lugar, 2005 he visited Russia with Lugar to assess Russian nuclear disarmament. Obama is to put it mildly a serious candidate and perhaps the only question marks about him are about his lack of experience. As the first black man to have a realistic chance at the Presidency, Obama though hasn't been greeted universally by the civil rights lobby with support. Many blacks hearken to his leading opponent for the nomination- Hillary Clinton- and her and her husband's long connection with the civil rights movement. Toni Morrison, in a quote I will return to, said that Clinton was the first black President. But even so the lack of support by civil rights groups is down to something else and both Morrison's quote and that lack of support reveal something about what it means to be politically black today. When I read that passage like most of the readers of this blog I blanched- Obama is black but there is a historical context to being black in the United States- a kind of inherited memory at least amongst those who are politically involved. In a recent piece on some historical work done on the New Deal, I illustrated some of these features but it includes a sense of resentment and entitlement for repayment for historical crimes commited by the early immigrants to America- slavery, the racial discrimination in welfare programs, Jim Crow etc. Rather than positioning him within a black tradition, Mr. Obama's speech evoked, through his and his family's varied races, trades and professions, a diversity that aims at unity. Blacker than any actual black person who could ever be elected in our children's lifetime. After all, Clinton displays almost every trope of blackness: single-parent household, born poor, working-class, saxophone-playing, McDonald's-and-junk-food-loving boy from Arkansas. And when virtually all the African-American Clinton appointees began, one by one, to disappear, when the President's body, his privacy, his unpoliced sexuality became the focus of the persecution, when he was metaphorically seized and bodysearched, who could gainsay these black men who knew whereof they spoke? Look at Morrison's quote, look at Dickerson's quote above and what they show I beleive is a fascinating thing about identity- they show that identity is not really about race. Obama is black- there is no gainsaying that. But he does not appear to have the hallmarks of what either Morrison or Dickerson think of as black- he doesn't have the background in the cotton fields of the south. Their identity despite what they call it is not racial, it is an identity based on the history of a group of people in the US who were segregated and treated badly because of their race- but that group in reality isn't defined racially, its defined by culture and politics. Perhaps its more defined by culture than by politics- notice neither Dickerson or Morrison's definitions would exclude a Black Republican like Alan Keyes who is descended from slaves, they only exclude a Black who isn't, even though like Obama he or she might have a lot in common with the speakers. The way that identity works is fascinating to me. Firstly we can see how maleable it is- Obama as the New York Times argues is a strong candidate because lots of people can beleive he is one of them. Secondly though we can see from this example that even when identity is based on a long history of racism, it ends up not being racial. People's imagined communities are not based on race but based on shared culture and experience- a black in this case who has emmigrated to the US recently has less in common with blacks in the US from the 1850s than a poor white southerner who endured much of what they endured in terms of rural poverty and the lifestyle it engendered. Obama almost certainly will gather in the support of the civil rights leaders should he become President. However its seldom in politics that you find a neater illustration of Benedict Anderson's principle that nationalisms and identities are imagined communities. Behind this mini-controversy lurks the imagined community of blackness in the United States- and that community consists of cultural markers and historical incidents. Many readers will find both Dickerson's and Morrison's attempts to widen and narrow blackness odd because the term is racial, but its less odd once one realise that that racial term merely signifies that one is a victim of racism in the United States (whether that be slavery or Jim Crow) in the past- it isn't actually a term which describes race. The word- black- isn't in this context helpful in understanding the situation- we are dealing with an imagined community based around culture and history. Clinton wasn't black yet in some sense according to Morrison was, Obama is black yet according to Dickerson in some sense isn't. Whether through Clinton and Obama the racial element of this identity is slowly being broken down is another matter- but what it does demonstrate is that an identity as a member of an ethnic minority that seems exclusively based on race- actually is based on culture and history. We have to also recognise that human beings are inconsistant and that their identities evolve. The mere fact of Obama's skin colour should he become President may change what it means to be black in the United States again- what that change will be, I don't want to predict but the whole business of identity is interesting and as the case of Obama's blackness signifies, its less to do with the facts than with the way that human beings imagine facts. This is an intersting post but i'm not sure i agree with it all. Firstly What I find remarkable is quite how much Obama's blackness is take as read given the very unusal background you refer too very accurately . He ran for a congressional district wiht a large black majority -and lost badly to a popular former Black Panther incumbant but not throgh being "unblack" , when he won the Democratic primary for Illinois Senator he had consitn support from black voters , when Keynes opposed him no one really suggested Keynes was somehow "more black" though his a US born one from a more "normal black" background. The press and blog coverage overhwelm accepts his black and does not challenge the idea that he is. This I think is related to the way hitain immigrnats are assiliing towards black American sub culture while non black hispanics eg mexicans aren ot-and indeed there are often vicious racial tensions between them-eg in Californian jails. On antoher note I would point out previous black candidates have had far from monothlic black support-Jesse Jackso at least the fist time he ran (and to some degree the second0 and very much Al sharpton-who was not even the most popular candidate among blacks for nonineee in 2004. There is a vice my supervisor often talks about which is to replace the words not only but also with the word not. I suppose this post describes some black opinion on Obama but not all black opinion and I should have been clearer. How much do you think that was Whites talking about Obama as a black individual? The lack of enthusiasm from Sharpton and Jackson is interesting though as you say both may have political motives for that. The stuff you print about Obama in Illinois is very interesting- its intriguing that these points are being made now. It was definitely an issue with Clinton though. The issue of immigrants assimilating to identities intrigues me in the United States- quite how that works I don't really understand especially with Irish and Italian American immigration as well. If the concept of 'black' is shifted to Condi and Colin Powell, it diminishes. Few would see them in those terms. The overwhelming 'strike against', from my reading of the US pundits is that it his lack of experience which is the issue. Again, a very interesting analysis - thank you. You bring up the whole question of whether it's your environment or your ethnicity that shapes you. I am still pondering this, although I am a European in a European country, and one who has a degree in the language of my adopted country and who has has studied its culture all her life. Yet, when I went back for a visit to GB in Oct., and found myself on a plane full of Brits, I found myself thinking, "Although we are all probably from very different backgrounds" [and you know how class is still a factor, sadly, n Britain, Gracchi] "I probably have more in common with any one of you than I ever will with an Italian". - Because we have shared cultural ASSUMPTIONS, I think, which is different from cultural experiences. This was a very difficult thing for me to acknowledge. I forget what I was on about in the first place now, but it somehow connects with what you are saying! Thanks again for the informative post. Welshcakes thanks very much for your compliments- you write some very interesting comments. I think there is something very apt in what you say about identity- shared cultural markers is the way I prefer to think of it- most Britons have watched Star Wars read some Shakespeare etc. Identity is maleable though. I'm not sure assumption is the right word though. But I get what you are saying- some point I'm going to write something about identity more generally but I like to proceed from particulars to generals first. Thanks for an interesting comment though- like you I'm not sure what I've done apart from go round and round in circles- but the joy in commenting is in the travelling not the arrival. ANd to be fair Keyes tried to make someting of it-with a total lack of sucess, and the polls seem to show hillary doing better with blacks in Illinois (possibl because her husband's so popular among themn) having said that I stand by what I say though i agree hat you said is interisng. You probably know that Eric Hobsbawm talked about the emptiness of national symbols - he said something like "the British stand for the national anthem, but what does the anthem stand for?" - and argued that is their very emptiness that makes them so ubiquitous; we each think we know what Britishness, for example, means, even if my idea is completely at odds with yours. The very advantage of flying flags is that we don't need to explicitly define our own view. Katherine Verdery also developed this line, talking of the need to be aware of the tensions within particular groups as factions strive for political ascension, and use their interpretation of group belonging to bolster their position. I should not be surprised, therefore, to see that very similar arguments can be used about ethnicity; a term that seems increasingly empty on the basis of discussions like this one. Not Saussure comes at similar questions to these from a different angle, and I fear I'm not going to resist weighing in with a post myself. Hobsbawm's work on invented traditions is fascinating in this context. I hadn't read the specific work you cite but I have read his work on invented traditions and lots of that is very interesting- that book which I think he edited has some fascinating details in it- the way say that the clan tartans are actually invented in the 19th Century for example after the Walter Scott furore. I'm looking forwards to your post on this issue I do agree that its all very mutable. Edmund I think you are right- this post really is an addition rather than a refutation or an exclusive post- and I think the points you add are interesting. I'm going to go out on a limb here and suggest that the 'black' people's problems with Obama is not that he is not 'black eoungh' but that white people seem to like him. I wonder if they'd Say the same thing about Collin Powell, Busta Rhymes, Tim Duncan, Biggie Smalls, Heavy D, Patrick Ewing, Tyson Beckford.. all recent immigrants to the US... If white people felt the same way about Obama as they felt about Biggie, his 'Blackness' would not be an issue. His experiences growing up have little to do with the argument. He did not grow up in Africa, he did not have a father figure, he ventured into some of the Vices we do like drugs.. and yet he still is not 'black enough'. As a black man.. what is the 'black experience'? I don't remember slavery. I wasn't there. neither was Obama. He has faced the same obstacles I have, what right do I have deciding how 'Black' he is. It is sad that the enemy of our development as black people in America seems to be ourselves. Of course. Neither will become president. They are both too divisive in a time of crisis. The US will vote for Guliani or McCain.